Synthetic Genomics’ Digital to Biological Converter can turn digitized DNA code into synthetic biological material, a milestone in medicine that could one day allow doctors to personalize medicine at their patients’ bedsides or fight epidemics halfway around the world. THE ITALIAN CONNECTION: The Burberry Foundation, an independent charity, is handing a three million pounds grant to Oxfam to help struggling communities in the Italian region of Tuscany, once a thriving hub of luxury leather and clothing manufacturing. The foundation grant has been earmarked to support “community cohesion” and help struggling families in the region which is facing increasing levels of poverty, youth unemployment and economic migration as traditional manufacturing dwindles. Burberry said the project in Tuscany is also in line with its own responsibility agenda to support one million people in the communities that sustain the wider luxury industry. The foundation and Oxfam will work toward improving integration between the Italian and migrant communities around Florence. The program will run until 2022 and will develop new and existing community centers that offer help, employment support, educational activities and Italian language classes. Apple Inc. is gearing up for a push to popularize augmented reality, launching new hardware and software in the coming weeks that would make it easier to use the new technology. At some point in their lives, black men are forced to realize that no matter what they do, some people will never see their humanity. To counter the negative perception of black men and boys, Chicago native Valerie Reynolds authored “The Joys of Being a Little Black Boy.” The book follows a blissfully innocent adolescent named Roy in Chi City as he gets to interact with historical black figures like Barack Obama, Frederick Douglass and Jackie Robinson. “Roy takes readers on a journey of joy through a historic adventure reminding us that many remarkable black men were once joyful little black boys,” the book’s publisher, Hurston Media Group, said in a statement to HuffPost. Reynolds told HuffPost why her book is so relevant to the present social climate. In order to ensure her message reaches the masses, Reynolds began a Kickstarter campaign. She aims to raise $ 7,500 not only for the book’s printing costs but also to donate copies to public schools throughout the country. As of Tuesday, the campaign has reached 70 percent of its goal. “This ‘big bad dude’ scared her because her understanding of Black men has been shaped by distorted images, stories, and depictions of Black men that are conjured by the media … media misrepresentations have real and tragic consequences,” Reynolds wrote on the campaign page. The pledge levels start at $ 5, and each donation of $ 27 or higher comes with one or more copies of the book, along with other small items. Some pledge levels are named after young black men and boys who have lost their lives to police shootings or other racially charged violence. Reynolds hopes that by August, the book will make its way to classrooms and be available in retail stores. A downtown Los Angeles-based apparel firm thinks it has the right formula to succeed in the customization and made-to-order space, promising all the quality of an atelier backed by proprietary 3-D software. Frilly, which launched in 2014, and has been refining its business model and building its technology, recently emerged out of beta with an online store offering customizable product to shoppers. The opening price is about $ 60 and goes up to around $ 2,000 to be able to take the company’s stock of chic separates and tailor the necklines, sleeves, fabric and on down to the hardware used in the garment. The company was founded by chief executive officer Shangwei Ding and chief marketing officer Jeni Ni and is entirely self-funded. It counts 24 employees in Los Angeles with a factory in China of about 80 and a software team of another 80. Tailors in China produce each garment, which goes through three rounds of quality control before being shipped to consumers within two to three weeks from the order date. This collection of rock criticism includes thoughts on hazing, lyrics, death and so much more. Model-turned-songstress Keeana Kee got a head start on summer with the steamy video for her debut single, “Coconut Rum and Coke,” and HuffPost has an exclusive first look. The song also features a rap by Latin pop icon and producer Maffio, who has collaborated with the likes of Maroon 5, Elvis Crespo and Pitbull. The Los Angeles-based singer, who is openly gay, told HuffPost that her video was inspired in part by homophobia she experienced during her years in the fashion industry. “I went through some discrimination in my life working as a fashion model, so I really hope to make a difference by encouraging people to be themselves no matter what, and to stand up for themselves, even if it seems impossible,” she said. Dance Theatre of San Francisco is the new kid on the block – a precocious kid on a block crammed with nimble little dance companies that turn out adventurous new work on a shoestring. Like many precocious kids, it manifests admirable talent but also exhibits immaturity. This is its second season, for which it offered up a potluck of three short impressionistic works by three local up-and-coming choreographers, and a new incarnation of Daphnis and Chloé that looks like DTSF’s bid to be taken seriously as a ballet company – a risky proposition in a metropolis that boasts the San Francisco Ballet, Smuin Ballet, Oakland Ballet, Ballet San Jose, Diablo Ballet, and that regularly plays host to every major world class ballet company. A dance company with limited resources has to make hard choices. When stuck with a venue with a poor sound system, like the Cowell Theatre, piping in taped classical music is amateurish, and yet three of the four pieces on display this weekend were performed to taped classical music. The exception was Dexandro “D” Montalvo’s terrific Ocean, whose throbbing electronic score shot through with industrial sounds did not require a sound system any finer than that at the Cowell. Live music may be beyond the budget of most small companies, but the Bay Area is simply bursting at the seams with cutting-edge composers and musicians who might be cajoled into serving up a score, live or taped, geared specifically toward the acoustic environment at the Cowell. When push comes to shove, Ballet to the People believes that you should make do with fewer dancers and employ a handful of musicians. Costuming was a resounding success – impeccable and stylish all evening, especially in the skin-toned, Grecian inspired swirling creations for Daphnis and Chloé. Hats off to Renaissance man Christopher Dunn who costumed everyone AND distinguished himself in lead roles all evening. Hard choices extend to other elements of a production – in particular, lighting. Two of the four pieces, by Sandrine Cassini and Milissa Payne Bradley, were ill served by their bare-bones lighting design. Cassini’s Here By Our Sight (to a tinny, scratchy recording of the Adagio from Schubert’s Quintet in C Major) started out with the dancers poetically lit in silhouette against a glowing background, then flooded the stage with overly bright, clinical lighting that washed out the dancers in their severe steel-grey unitards and diminished the strangely tender moments in the choreography. Payne Bradley’s Your Sun Becomes My Moon set up two parallel universes in which intimate relationships between two pairs of dancers unfurled simultaneously onstage, a concept which begged to be supported by a bifurcated lighting scheme that simply didn’t materialize. 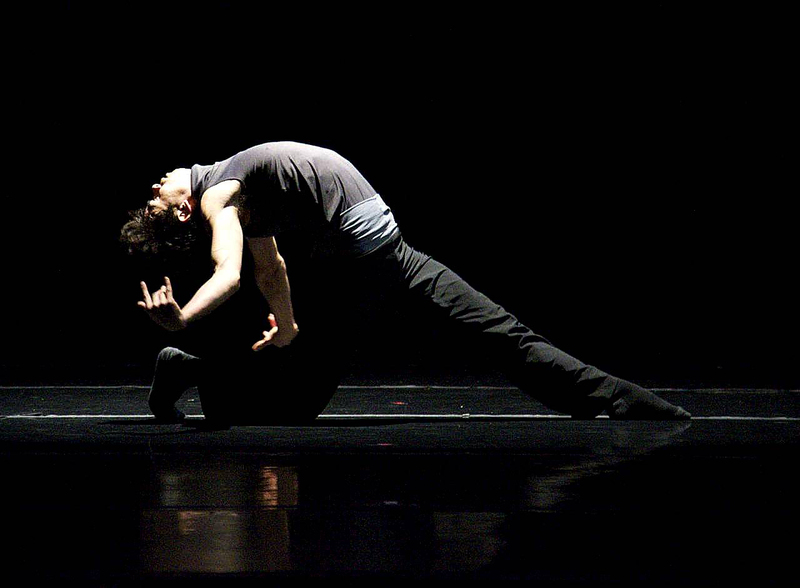 One doesn’t expect a pick-up company to display a unified style or aesthetic, and the three short pieces did play to the dancers’ individuality. 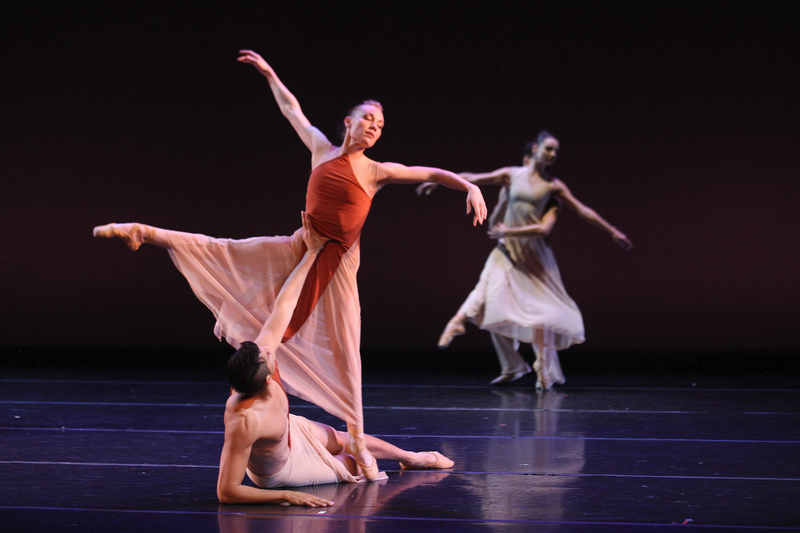 Daphnis and Chloé however is a different breed of dance, and the ensemble of thirteen powered heroically through Mark Foehringer’s ecstatic neoclassical choreography with a dizzying range of manners. Perhaps more rehearsal time would have hammered out a more consistent carriage of the head, arms and shoulders, and more uniform leg extensions… but the work is simply not innovative enough to make it the focal point of a brave new venture. Though Foehringer’s pared-down interpretation of the classic tale verged on a storyline for the Desperate Housewives of Ancient Greece, the splendid, regal Jamielyn Duggan rose above cliché in the role of the scheming Lycaenion, ably supported by Ismael Acosta. Christopher Dunn and Kelsey McFalls shone sweetly in the title roles, and Marcos Vedovetto proved a commanding Pan. There is a bleak edge to Cassini’s work as well, the dancers frequently looking out over an abyss but always drawing each other back. They initially look very comfortable in Cassini’s movement style, which is cat-like and ethereal but also very grounded. There are tantalizing hints of A Midsummer Night’s Dream with a mischievous Puck-like figure – danced with brio on Sunday by Angela Bevevino – who gambols among the sleeping figures of two unsuspecting maidens. However, midway through the piece, as the Schubert builds in intensity and anxiety, the choreography turns more nakedly athletic. The piece looks unfinished, as if the choreographer was testing out movement ideas in the second half but didn’t have time to polish it, and the dancers appeared to struggle. Payne Bradley’s piece is driven by Arvo Pärt’s austere and mystical Summa for Strings, whose waves wash to shore two couples: one entwined in a luscious contemporary duet, the other in a formal, purely classical pas de deux. Alexandra Fitzgibbon and Michael Galloway, in chic swimwear marked with fields of color suggestive of Mark Rothko, are never less than stunning as they explore unstable, shifting sands. Their movements suggest some kind of marine creature. They cede the stage to Ana Robles and Joshua Thake, she in a long diaphanous tutu and he in a princely tunic, and we are reminded that the language of classical ballet is objectively no less contrived or exotic than the movement of jellyfish or sea dragons. Robles and Thake seemed poorly matched or under-rehearsed, however, which, together with the lighting failure, diminished the impact of this otherwise glamorous and quirky work. At the start of the evening, company Executive Director and Artistic Advisor Annie Henry (who also brought an elegant presence to the ensemble in Daphnis and Chloé) delivered a graceful pitch for donor support. Money is not the only thing the company needs right now. It is not enough to employ dancers and give free rein to talented choreographers – there must be a vision in the curating of a program, and a discipline to the myriad decisions around scoring, casting, time and resource allocation. There must be someone with the experience and authority to sit in on rehearsals and make a judgment as to what is ready to be presented and what is not. In young companies, understandably, artists often must wear more than one hat. At present, in this company, there are important hats that no one is wearing.